This product from Chess Baron: Chess in the Black Castle. 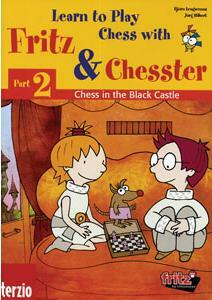 In a black castle - Fritz, Bianca and Chesster are back in a new chess adventure! Jump into chess action to rescue Chesster from deep within the walls of King Black's Castle. You'll have lots of fun learning move by move about openings, middle game strategy and tactics, endgames, pinning, delivering check, attacking, protecting - and much more. Jump into chess action, move by move, to rescue Chess from Deep within King Black’s castle. Join Fritz and Bianca in a thrilling chess adventure as they enter rooms of the castle, where each challenge will help you sharpen skills and prepare for the ultimate showdown. Part two of the famous chess game 'Learn to play Chess with Fritz and Chesster'. Powered by Fritz, the world’s leading chess software; Learn about tactics and strategy, the opening and endgame; Developed together with experienced children’s chess coaches. Try out over 20 mini games within the game to practice what you've learned and see if you can get your name onto the high scoreboard! System requirements: Multimedia PC: Pentium II 233 processor, 32 mb ram, 16 bit soundblaster compatible sound card, CD-Rom Drive, Graphics card, Win 98/ME/XP/Vista.